New York Times and USA Today bestselling author BRENDA JOYCE returns with this classic de Warenne tale of lasting love. 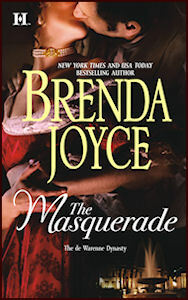 THE MASQUERADE is emotional, it is passionate and it’s a Brenda Joyce novel that will have you sighing and rereading time and time again. Her mother was standing directly behind her and speaking loudly, so the little girl could, unfortunately, hear her every word. She buried her face in her book, trying to concentrate on the words there. It was impossible, for they were staring, Lizzie’s cheeks were hot. Lizzie gave up trying to read, hugging the precious book to her chest, hoping Mama would not march over and take it away. Her cheeks now burned with embarrassment, and she wished they would talk about something or someone else. But Mama and the pastor’s sister were strolling back to the other adults. Lizzie sighed in relief. Perhaps a summer picnic by the lake was simply the wrong place to read. It was a large gathering, one that included her family, their closest neighbor, the pastor and his family. There were seven adults present and six children, including herself. Her sisters and friends were currently playing pirates. Shrieks and laughter punctuated the lazy June afternoon. Lizzie glanced at the entire scene, briefly watching Anna, who had been appointed a damsel in distress and was pretending to weep over some misfortune. The pastor’s oldest son was trying to console her, while his younger son and neighbor’s boy were wielding sticks, creeping upon them, clearly in the role of pirates. Georgie lay upon the ground, the victim of some terrific misfortune. Lizzie hadn’t been invited to play. Not that she wished too. Reading had intrigued her from the moment she could identify her first few words, and in the past six months, suddenly, as if by magic, she could look at a sentence and most of the words made sense. As quickly, reading had become her passion and her life. She really didn’t care what she read, although she did prefer tall tales with dashing heroes and sobbing heroines. She was currently reading one of Sir Walter Scott’s stories, never mind that it had been written for adults and it took her an hour or more to read a single page. Lizzie took one more look behind her and realized she had been left very much alone. The adults were now seated on several large blankets and were opening up their luncheon baskets. Her sisters continued to play with the boys. Lizzie felt a flutter of excitement and she opened up her book. But before she could begin to reread the last paragraph where she had left off, a group of riders came cantering to the edge of the lake, just dozens of feet from where she sat. Their voices were male, boisterous and young, and Lizzie looked up as they leapt down from their horses. Instantly fascinated, she realized that there were five boys, all in their adolescent years. Her interest and curiosity increased. They had been riding five hot-blooded horses, and they wore well-tailored, expensive clothes. They had to be aristocrats. Laughing and shouting, they were stripping off their jackets and shirts, revealing lean, tanned and sweaty torsos. Clearly a swim was in order. Were they from Adare? Lizzie wondered. The earl of Adare was the only nobleman in the vicinity and he had three sons and two stepsons. Lizzie hugged her book to her chest, watching a tall blond boy dive in, followed by a leaner, shorter, dark-haired youth. Hoots and hollers sounded and two more boys dove in, causing more shouts and more laughter and the beginnings of s splashing match. Lizzie smiled. She didn’t know how to swim, but it certainly looked like fun. Then she glanced at the boy who remained standing on the bank. He was very tall, his skin as dark as a Spaniard’s, his hair has black as midnight. He was all lean, rippling muscle—and he was glancing curiously at her. Lizzie shoved her face in her book, hoping he didn’t think she was fat, too. He snickered at her. He was mean and Lizzie despised him. “If you want it, come and get it,” he taunted. He was three years older than she was and a good three inches taller. Lizzie reached for the book; he merely held it up over his and out of her reach. He laughed at her. “Bookworm,” he sneered. He held the book out to her—and when she tried to seize it, he turned and threw it in the lake. Lizzie gasped, staring at her books as it floated in the water by the shore. Tears filled her eyes and Willie laughed again. “If you want it, go get it, fatty,” he said, walking away. Lizzie didn’t think. She ran the few steps to the lake’s edge and reached down for the book. And to her utter shock, she lost her balance and fell. Water closed in around her, over her, Lizzie’s mouth filled with it and she coughed, took in more water, and began to choke. As she sank, down beneath the surface, choking, incapable of breathing, she panicked, suddenly terrified. Strong hands seized her has she flailed and suddenly she was above the water, in a boy’s arms. Lizzie clung, her face pressed to his hard chest, choking and sobbing at the same time. He started striding from the lake and Lizzie began to breathe the panic and fear instantly subsiding. Still grasping his slick, strong shoulders, Lizzie looked up. And into the most amazing dark blue eyes she had ever seen. “Are you all right?” her savior asked, his regard intent upon her. Lizzie opened her mouth to speak, but no words came out. Their gazes held and she simply stared, and as she stared, she fell. Headlong, helplessly, hopelessly into love. Her heart skidded and rushed and raced and swelled. “Lizzie! Lizzie! Oh, Lord, Lizzie!” Mama was screaming from farther up the bank. “Are you a prince?” Lizzie whispered. But he was a prince, Lizzie thought, incapable of tearing her gaze from his handsome face. He was her prince. “Lizzie! Is she all right? Is my precious baby all right?” Mama was in hysterics. “How can we ever thank you, Lord Tyrell?” Mama cried, grasping both of his hands now and diverting his attention. “There is no need, Mrs Fitzgerald. She’s sage, and that is thanks enough,” he said. And Lizzie realized who he was—the next earl of Adare, the earl’s eldest son, Tyrell de Warenne. She hugged her knees to her chest, still staring at him, stunned. But then, hadn’t she known he was a prince—or nearly the equivalent of one? For in the south of Ireland, the earl of Adare was very much like a king. Lizzie bit her lip, too shy now to even thank him. “Lord Tyrell, we are in your debt,” Papa said seriously. Tyrell waved dismissively at him. He looked around and his eyes hardened. Lizzie followed his gaze and saw him coldly eyeing Willie O’Day. And for the first time in his life, Willie did as he was told, weeping as he begged Lizzie for forgiveness.